We don’t know about you all, but we’d love to see more positive news/profiles and we need your help! Who do you know who has been a great neighbor recently? What area school/organization/business has made a recent contribution to the neighborhood? Why do you love and live in this area? While we’re working on People of Church Hill on our Instagram feed, we want to hear from you! 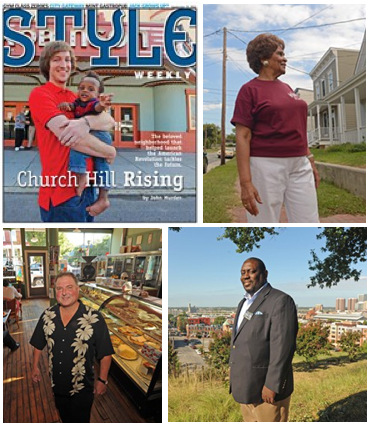 Contribute your own stories and let’s highlight the “People” part in Church Hill People’s News. Comment and give us a background and then we’ll follow up! We live in churchill area since we come from California’ It remind me the city where i am from. I love my wife, my children, my sister, my brother in law, my neighbors, my realtor, my doctor, my lender, my house, my job, and the Front Porch Cafe. I have no reason to leave Church Hill. Mr Saxophone still exists, Mr Yanker. He is *not* a positive person and should not be included on this list. Playing the saxophone in the middle of the night for hours on end in a residential neighborhood is terrible, unneighborly behavior. And before anyone jumps on here and says – “oh, I like saxophone music” or “oh, it gives the neighborhood a cool vibe” – try living next to it for awhile and then come tell me how cool it is. He is also a TERRIBLE musician and can barely play. If you hear actual music coming from that corner, he is usually playing a boombox of saxophone music (FAKER). He is hands down one of the worst people who lives in Church Hill. I love all my neighbors even if some of them are wahoos. These stories were about scams, waste of taxpayer money, graffiti and people profiles. I use my real name and am not ashamed of what I post and can back up any claims I make, yet I am censored. @jean Maybe, the other reason is that we turned off the comments that were coming directly from Facebook and Twitter. Things look like they’re not being seen because the “likes” were usually implemented as comments when they really were not. But you’re right, things may seem a little slower lately and this is directly the cause of us using our time to grow the website in other ways. I’d also like to remind you that we are running a skeleton crew. The website redesign is taking a LOT of our time and effort. I also will remind you though that commenting is a privilege and we will not tolerate any personal attacks to any neighbor anymore. You know what you wrote and this is the only time we’ve “censored” you. This is not Facebook and we have a clear policy for comments. Anyway, I do appreciate your brutal unedited honesty, and all I can say is we’re going to get our groove back. Yes, I know what I wrote. I am not ashamed of what I wrote. I use my real name and take full responsibility for anything I say. I would write it again because it is true! I appreciate Jeans contributions to neighborhood conversation, and to the neighborhood. I see the not-so-veiled threat to block her from participating in this platform. I also would not characterize her comments here as either brutal or unedited. I don’t think that’s true—which matters to me. About this turn towards a general social justice warrior platform and conversational style. My opinion— it often replaces difficult real world conversations with a drawn out word battle over who is mean/racist/to blame, while barely increasing knowledge or understanding of the world and its real issues. It seems more interested in scoring points than actually helping people and neighborhds to do and be better. Its like watching the angry and hurt debate club argue about why the car has a flat tire. how about we change the tire— or talk about how one might— instead. It’s a tough time for productive conversation, and for truth nationwide I think. In that context I often appreciate Jeans weds. Thanks Dubois. Jean and I actually had a really productive conversation off site where I pretty much tell her the same thing. Personally I appreciate her point of view. Sometimes the emotional response is to be hurt instead of thinking clearly (speaking for myself). ” I don’t know what else to say except I’m sorry we’re disappointing you but we’re working hard at fighting the good fight while dodging the ugliness you don’t see in the background: the racist messages, the threats, the books being thrown in our backyards, the countless people who say they want to help and never do plus the constant comparisons to Murden. I know you have a choice to read whatever website you like but I’m coming at this with only one agenda: to keep this website going and to allow this neighborhood and, maybe selfishly, myself, find our voice. Dubois2, There are so many people that are much more eloquent than I am. Thank you for your post. No one is liked by everyone and I am no exception. However I do not NEED to be liked and as you may know, I march to a different drummer than most and am not afraid to confront underhanded, sneaky and dishonest behavior when I run across it. To that end, I have been targeted by people that won’t reveal themselves and have done some pretty mean, petty things. The breaking point for me was when someone started attacking my pet Geese. I had noticed some rocks in the front yard that didn’t belong there, then one day Tucker mysteriely had a bloody bill. I was convinced that it was teenagers being jerks! I installed a surveillance camera and was shocked to find that it was an older, gray haired man throwing rocks at my Geese . I was able to confront him and the animal abuse stopped! Now if you don’t like me that is fine, but a so called adult took it out on my Geese. Not the kind of mature, kind, thoughtful neighbor we would all like to have. It is one thing to state your opinion and should be acceptable in a civilized society. It is UNACCEPTABLE to retaliate against someone by throwing stuff at them, threaten them and disparage their work all under an assumed identity. @Gustavo, I understand “growing pains” as you try to modify the platform & make this site yours to benefit the neighborhoods. Wishing you more comfortable days to tinker/tweak & achieve success on that front. I wholeheartedly echo everything Dubois2 wrote. I would miss Jean’s snappy & funny no holds barred insight on our collective communities. Conversation is paramount, regardless of the subject. Jean is honest & direct without an ounce of “political” bias”. The lady cares. Firebrands like Jean, Bill’s wahoo neighbors & folks like Garrett with love for family, friends, neighbors & all of those that orbit his world make Church Hill the f-ing funkiest & cool places to call home. Contributing to the positive… I found a big Chewy.com box torn up & spread around in my back yard. I called RPD non-emergency & they were out within the hour. Two huge cops came out. I didn’t touch anything in case they wanted to tape off the area, dust for prints, take DNA samples…you know, police stuff 😉 They gathered up all the items, found the invoice in the bushes, checked everything & the contents (squeaky toys, stuffed animal, treats, little things) were all there. I asked if it was OK if I deliver it to the victims of this pooch package purloining. They said, “Well take care of it ma’am.” I’m sure tails were wagging when that door bell rang.